Mozzarella, Ricotta, Queso Oaxaca and Italian Burrata! or if you are a CSA member, just email us here that you’d like to be included: CSA@morningsongfarm.com. For more info: donna@morningsongfarm.com. We’re looking forward to this Saturday’s Cheese Making Class with Virginia Masters. She’s teaching us how to make Mozzarella and Ricotta, as well as the more unusual Queso Oaxaca and Burrata Cheeses, all from cow’s milk. This class is the 2nd in a series and includes enjoying your cheese on a barbequed quesadilla or pizza at the end of the class. We’ll have a farmer’s market stand with cheese making kits for sale, as well as farm produce. And we’ll do a goat milking demonstration at 9:00 sharp, so plan to be here a few minutes early! Meet our herd of baby and adult Nigerian dairy goats. Carl, the Herd Leader requests that you bring something crunchy, his current favorites include granola bars. 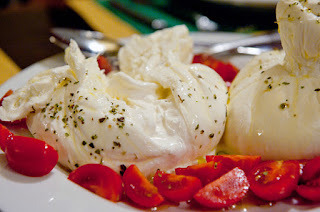 Many haven’t heard of Burrata Cheese, but after making it here we think it will be among your favorites! Some people have confused this Italian cheese with Mozzarella, or even Ricotta. But it’s a cheese variety that stands on its own. Burrata means “buttered” in Italian, which hints at its richness. There are similarities to Mozzarella, but Burrata is far richer, softer and creamier. 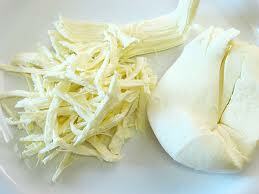 The other cheese on the menu that is lesser known is the Mexican traditional Oaxaca Cheese. Named after the state of Oaxaca in southern Mexico, it is a white, semi-hard cheese which is best known for adding its distinctive taste to authentic quesadillas and empanadas. Queso Oaxaca is just hard enough to be able to be grated; similar to unaged jack cheese, but with a consistency closer to mozzarella..
Ricotta Cheese is the third cheese of this fun day, and I’m particularly excited about the dessert recipe possibilities that this sweet curd cheese offers. Ricotta is an Italian cheese made from the liquid leftover from other cheese making activities. Because it is so highly perishable, and it uses the by product of other cheese making ventures that would otherwise go to waste, learning how to make this easy cheese at home is a must!